They were high school sweethearts, soul mates from ages 15 and 17, married at 18 and 20, and welcoming their first daughter at ages 20 and 22. 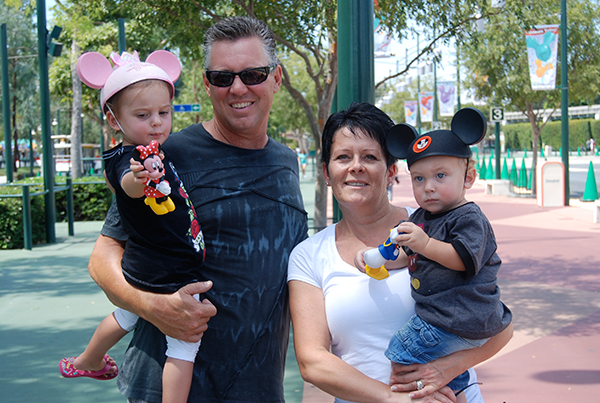 Elaine and Chuck were blessed with three daughters, Christa, Jenelle and Tiffany. They were blessed with professional success, and lots of opportunity for travel and adventure. Most important, the home was filled with lots and lots of love. “Chuck loved life; he loved the Lord; he loved his family; and he loved his friends. He was my rock, and losing him was the crushing blow that shattered my world as I knew it,” said Elaine. Grief-stricken but full of faith and determination, Elaine and her girls decided to honor and celebrate their husband and father any way they could. 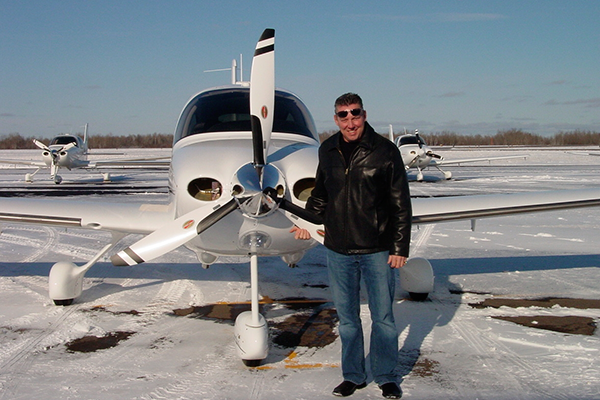 As a strong Christian, a man of faith, Chuck believed that it was a privilege to give back. Chuck supported The Mustard Seed Foundation, a Christian outreach organization. Locally, the foundation was building housing to help Calgary’s homeless get back on their feet, so upon Chuck’s passing, Elaine and her girls made a sizable donation in Chuck’s name to the foundation. It was decided that the donation would be designated toward an outdoor patio at the Centre. 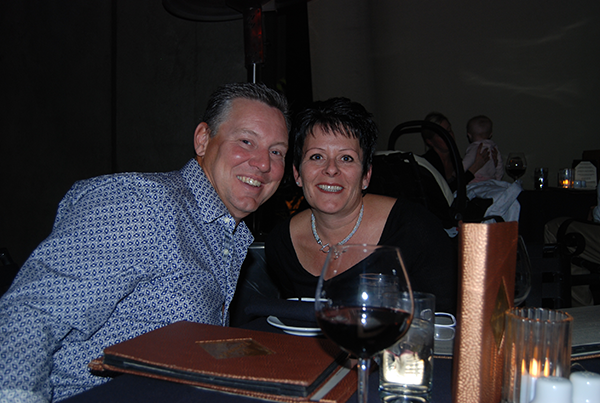 On September 24, 2014, on the fourth anniversary of Chuck’s passing, Elaine and one of Chuck’s dearest friends, golf pro Kent Racz, organized the Chuck Matson Memorial Golf Tournament and Fundraiser to raise additional funds for The Mustard Seed’s housing project. The donations helped bring about the completion of the beautiful patio area, furnished with barbecue grills and outdoor furniture. 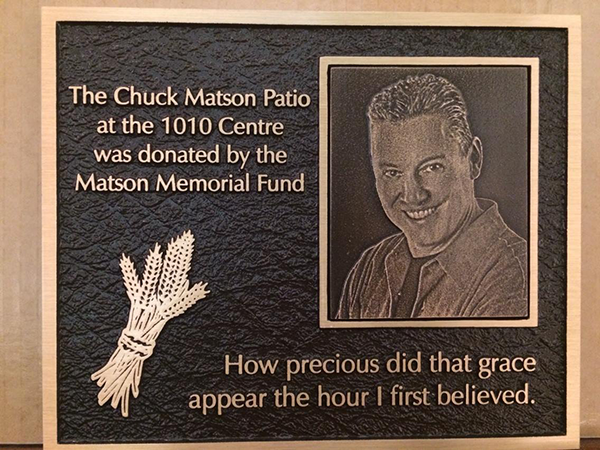 The finishing touch was a plaque that reads, “The Chuck Matson Patio,” which hangs at the entrance to the patio at the 1010 Centre. Chuck always believed that it was a bigger blessing to give than to receive. February 14 was always a special day at the Matson house. It was one of Chuck’s favorite holidays, which gave him the opportunity to spoil “his girls.” Chuck would often deliver roses and carefully selected cards with personal notes of love and encouragement to each of them. Sometimes he would surprise them with a little something extra special, as Elaine described, “One year he worked with a local jeweler in Calgary, who helped him create a beautiful diamond pendant for each of us.” He liked to do things that were special and meaningful; he had a huge heart and he loved to bless others. That first February 14 after Chuck passed, Elaine had special necklaces made to remember him. Collaborating with the same jeweler who had created the custom necklaces a few years earlier, they used digital technology to create a mold of an exact replica of the aircraft [the one where their father had spent his final moments]. The jeweler added diamonds along the wings of the plane, a beautiful piece each of the girls treasure. Elaine’s personal favorite locket is her “Chuck Locket.” It shares his story: the Airplane Charm, the April birthstone for the month he was born, the September birthstone for the month he passed, the Angel Wings Charm, his initial “C,” the In Memory Of Heart Charm, the scripted Love Charm and a Butterfly Charm that symbolizes a special story. The opportunity to celebrate Chuck’s memory – and the ability to capture meaningful memories in a keepsake locket – touched Elaine deeply. This was something she knew she could share. Having built a successful direct sales business with another direct selling company for over 20 years, she was intrigued with the idea of joining Origami Owl as a Designer. But the custom jewelry company wasn’t in Canada yet, so she patiently waited until the launch in 2015, when she would become a Designer with Origami Owl Canada. In Memory of Chuck from Christa Coppola on Vimeo.